CAPE TOWN, May 28 2014 (IPS) - To curb greenhouse gas emissions, South Africa wants to put a tax on carbon emissions from big polluters. The aim of making polluters pay for the carbon they pump into the atmosphere is to help South Africa, the world’s 12th highest emitter of greenhouse gas carbon dioxide, transition to a low-carbon economy. “We have one of the most carbon intensive economies in the world,” Anton Cartwright, a researcher on the green economy at the University of Cape Town’s African Centre for Cities, told IPS. Coal-burning power plants provide close to ninety percent of South Africa’s electricity, making the economy highly carbon intensive. Initially, the carbon tax would see big polluters, including companies in the mining, fossil fuel and steel sectors, paying 11.50 dollars per tonne of carbon dioxide equivalent on between 20 and 40 percent of their total carbon emissions. To cushion the effect on industry, the National Treasury has proposed allowing polluters to lower their tax liability by investing in carbon offsets. A carbon offset is a measure that reduces, avoids or sequesters emissions. Polluters buy credits, each equivalent to one tonne of carbon, from verified projects — including, for example, reforestation programmes and initiatives that increase energy efficiency in the housing sector — at prices cheaper than the tax. South Africa’s large-scale carbon offset market is currently stagnant. In Europe, carbon credits are selling for less than 50 cents, Louw said. Without the carbon tax big South African emitters have no obligation to reduce their emissions or engage with carbon offsetting programmes, Carl Wesselink, director of SouthSouthNorth, a Cape Town based non-profit organisation that focuses on climate change and development, told IPS. The carbon tax should change that. The proposed carbon tax and offset legislation will increase demand and price for carbon credits, Roland Hunter, a consultant at C4 EcoSolutions, told IPS. C4 EcoSolutions is a firm that consults on a government offset project which involves reforesting degraded parts of the Eastern Cape province with Spekboom, a succulent tree with a high potential for capturing carbon. South Africa’s flagship carbon offsetting initiative, the Kuyasa CDM Pilot Project, which is registered with internationally recognised credit scheme the Clean Development Mechanism (CDM) — established under the Kyoto Protocol — has been slow to issue carbon credits. 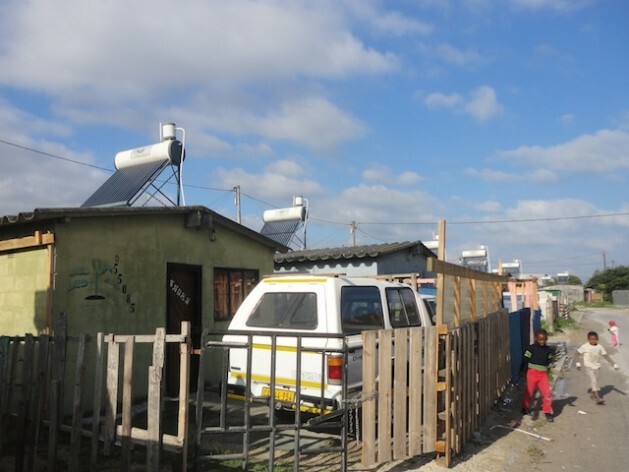 The initiative involved retrofitting 2,300 low-cost homes in Khayelitsha, a semi-informal township outside Cape Town, with solar water heaters, ceiling insulation, and energy efficient light bulbs. These energy efficient measures save 7,000 tonnes of carbon dioxide equivalent per year. But despite being registered with the CDM in 2005, and being completed in 2010, the award-winning project has not yet issued any carbon credits. A combination of bureaucratic red tape, from local and national government, combined with the CDM’s protracted verification process, is to blame for the lack of credit trading at Kuyasa, said Wesselink, whose organisation developed the project and, as a partner to the City of Cape Town, is responsible for trading the carbon credits. An estimated 10,000 CER (Certified Emissions Reduction) credits should be issued this year, he said. The money from the credit sales will go into maintenance costs, which are currently being shouldered by SouthSouthNorth with donor funds. The funds are needed since the solar water heaters made by a Chinese company, and numbering 1,500, are prone to rusting and leaks, and have a short-life span, Zuko Ndamane, project manger for the Kuyasa CDM project, told IPS. When the credits are sold, the project will invest in replacing the rusting geysers with units from a South African company, which have a 20-year lifespan, he said. Kuyasa was not established to make a financial profit. With the project costing about 3.5 million dollars it would take decades to recoup the costs through selling carbon credits alone. The return on investment from a public health and social development perspective is worth the financial outlay. But such projects need to be done at a larger scale to make financial sense, he explained. The carbon tax and associated offset options should see an uptick in trade for carbon offsetting projects in South Africa. But industry remains concerned about the looming tax, especially state-owned power supplier Eskom. Eskom would not be able to absorb increased production costs from the carbon tax, Gina Downes, Eskom’s corporate consultant for environmental economics, told IPS. The utility has been in talks with National Treasury about ways to account for the costs associated with the implementation of the Department of Energy’s 2010 Integrated Resource Plan, which lays the path for the share of coal-fired electricity generation in South Africa to drop from around 90 percent in 2010 to 65 percent in 2030, Downes added. Analysts expect to see some changes in the final tax related to its impact on the national utility.